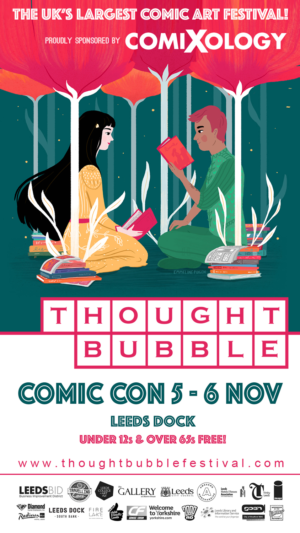 Thought Bubble, the UK’s largest comic book festival, announced today that comiXology, Amazon’s premier digital comic shopping and reading service, will act as the major sponsor of the 10th anniversary edition of the Thought Bubble Festival. The new sponsorship brings together the UK’s biggest sequential arts festival and the leading company in the field of digital comic books, graphic novels, manga and bandes dessinées. Babs Tarr, Brenden Fletcher, and Cameron Stewart, creative team behind the breakout hit The Batgirl of Burnside. The sponsorship marks a new direction for Thought Bubble with ambitious plans to expand the festival in Leeds and build a wider profile in the UK and internationally. ComiXology’s support will be realised with a special 10,000 sq. ft. comiXology-branded space which will enable more fans than ever before to attend the festival. The convention space will also be complemented by comiXology’s sponsorship of Thought Bubble’s panel talks and industry events throughout the convention weekend. In addition, comiXology will release a special digital edition of the Thought Bubble Anthology, designed to celebrate the festival’s 10th anniversary.